This quick start guide is intended to show you some of the functionality of the University’s Virtual Learning Environment (VLE) powered by Blackboard. It is the first step to getting familiar with the basics of using the system and will sign post you where to find help and support. You can also use your personal sandbox module to experiment with the different options and content types. 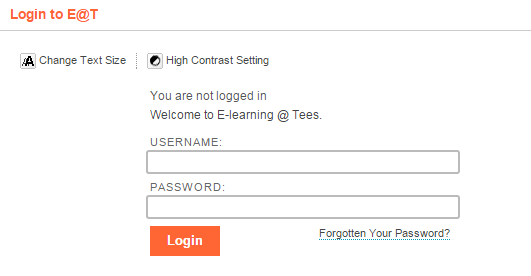 Go to https://eat.tees.ac.uk and login to the environment using your IT user ID and password. This is the one you use to log in to your work computer and your email. The first time you login to the system you get a welcome overlay screen informing you of several new features, including the Global Navigation Menu. Click Close on the overlay screen to reveal your Home Tab. The Global Navigation Menu can be accessed from anywhere within the system by clicking your name in the top-right corner where you will see your name. modules. You can reply to posts from this page. Navigation Menu under Settings and Edit Notification Settings. The Retention Centre will display monitoring information from courses you are tracking. This feature is to track performance based upon set criteria. On your Home tab there are two areas called Current Modules and Previous & Future Modules. They list which modules you are teaching on or participating in. The Current Modules lists all of your currently active modules, while the Previous & Future Modules lists any inactive modules, grouped by academic year. Inactive modules are those from previous academic years and any future modules which are not yet running. 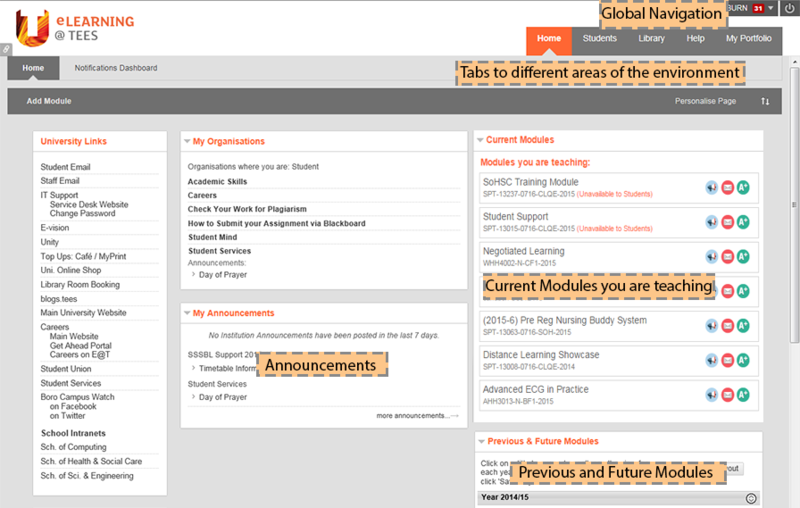 You can also see any Organisations you are enrolled in as well as the Announcements from the modules. Modules in your Current Modules box are automatically displayed alphabetically and by availability. You can rearrange the module order by selecting a module name and performing a drag and drop to reorder modules in the list. All modules in the VLE have a module name followed by a module code. There are different types of modules that get created in the VLE; ones that come out of SITS (the University Student Records system) and have SITS codes and ones that come from the Support Module Database which have an SPT code. The SITS code that refers to “what” is being taught. E.g. ACC4007-N. The Period Code that refers to “when” the module is being taught. E.g. BJ1. (See box below for more info on Period Codes). The Academic Year in which the module starts. E.g. 2015. The academic year runs from 1st August to 31st July. Therefore, the period code is defined as A for August, B for September, C for October, and so on. The number following the two letters denotes the number of academic years that the module spans over. So, for example, a module with period code CJ1 starts in October and finishes the following May, whereas a module with period code BC2 starts in September and finishes in October the following year (i.e. it’s 13 months long). The SPT code and a number to identify it in the database. E.g. SPT-12722. The module end date in the format MMYY. This is specified when the module is created in the Support Module Database. E.g. 0715 is current until the end of July 2015. If you are the designated Module Leader in SITS (the University Student Records system) you will be added to a module automatically. Module Leaders can add further teaching staff to their modules. Alternatively, staff wishing to be added to a module can complete the Module Leader Request Form on the Home tab. As a module leader you will need to access your modules in edit mode in order to add and customise content. The edit option is located at the top right of the screen. Management of your module is done via the Control Panel. You should see the Control Panel at the bottom left of all of the modules you are teaching on. 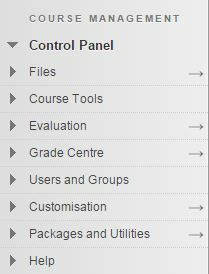 The Control Panel is made up of several areas which you use to both organise the module content as well as managing communication and assessments for your students within the module. Clicking on the small black right-facing triangle next to an area will expand that area and allow you to view the associated options. If the triangle is downward-pointing then the area is already expanded. Clicking the triangle again will collapse the area. For example, expanding the Customisation option reveals the customisation options available, as shown. Announcements can be a vital part of communicating with students. There are two different ways to post announcements but they both do the same thing. One is to go to the Announcements area of your module with Edit Mode on and you will see a Create Announcement button. 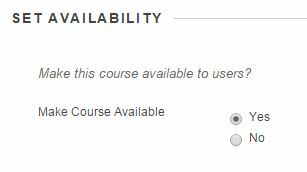 The other is to go to the Control Panel, click the drop-down arrow to expand the Course Tools area and click Announcements. In both ways, click Create Announcement and type a Subject and your Message. In the Web Announcement Options section; Duration allows you to optionally set date restrictions for the announcement. Announcements not date restricted will remain visible to students until removed or date restricted. If you wish to email the announcement, tick the box labelled Send Announcement Email. Click Browse to create a link if you want to draw attention to a newly posted item elsewhere in the module. Note: Links will not be displayed in announcement emails. Many students access the VLE using the Mobile Learn app for iOS and Android devices. A notification will be sent automatically to their device every time an announcement is posted. However, the speed of delivery is outside of the University’s control and can take up to a day in some situations. Because of this, it is important to make sure that students are not relying on these notifications for urgent, short notice announcements (e.g. lecture cancelled). 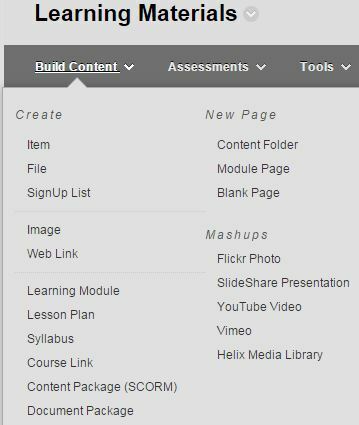 Content can be added in this area by using the Build Content, Assessments and Tools menus shown below, which give access to a variety of items, tools, and resources. 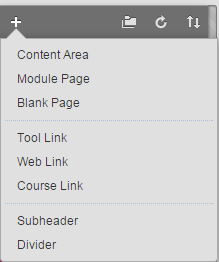 In the Build Content menu, under Create, you can add content Items, Web Links, Course Links and Mashups. Under the New Page area you can also create some Content Folders to help you organise your items. 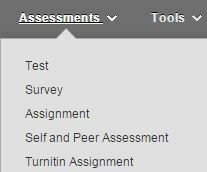 The Assessments area includes the various types of assessment tools including Tests, Surveys, Assignments and TurnitinUK. Tools is where you can now find Discussion Board or link to/create a Groups of students. The tools menu as with the other menus include many other options not shown here like Blogs, Journals and Wikis. For more information on all of the tools and resources shown here please please search further knowledge base articles. Tip: Use your sandbox module to experiment with the different content types. There is a step-by-step format for adding content which is similar to sending an email with a file attached. The steps and options you choose vary with the kind of content item you want to add, but the basic principle remains the same. To add a basic item, select Create > Item under Build Content. Type the text you would like displayed on the page into the Text Box Editor shown below. You can do several things within the Text Box Editor, such as adding video straight from your webcam or YouTube. You can insert a file or image as well as adding mathematical equations if you need to. Ensure that the Show More button is selected to view the full text box editor options. To insert video content select the Mashups option there is a separate guide on adding video to Blackboard. You can also insert files into the text box editor area. If you use this way of attaching files to your module it could be a good idea to add your files to the Course Files area first, search for the Course Files article for more information. Using this method allows you to describe the files you are attaching and give them a context within your description. The Attach File button on the text editor toolbar will allow you to browse for your file(s) and choose some text to act as the link to the file. Browse My Computer which enables you to upload file(s) from your computer or networked drive. Browse Course lets you link to file(s) already in your Course Files area. When using the Browse My Computer method, click Browse to locate the file you want then click open to attach it. If you have uploaded a Word document or your PowerPoint slides you only see the default option of Create a link to this file. In the standard options section you can select the appropriate options for the item. Permit Users to View the Content Item – ‘Yes’ means that your students can see the document. Typically, documents are made “invisible” (this option set to ‘No’) when you don’t want students to access them yet. You can change this at any time.Note: if you want to time release material, you should set the Permit Users to View the Content Item to Yes and then enter date restrictions. Track Number of Views – This option lets you track how often individual users view the document. Select Date and Time Restrictions – This option lets you set the dates that the document will be visible. Scroll down and click the Submit button. A green Success receipt will be generated at the top of the screen and the new item is added to the bottom of the existing list of content. When you add anything to a module whether it is a menu item or content folder it will always appear at the bottom of the list. The Folder feature allows you to create folders to help you organise and sort your module content. Folders make it easier for students to find documents by limiting the amount of scrolling they need to do and by identifying specific topics. You can put a folder into any content area in the same way as you added an item. Go to Build Content, (making sure that Edit Mode is turned on) and under the New Page area you will find Content Folder. Click this option. Optionally type a Description of the contents into the Text field to help students identify the folder content. Set any time release details. When a folder is created, its name will appear underlined as a link. To add content to folders, click on the folder name to ‘open’ the folder. Then proceed to add content using the options on the Build Content menu. You can change the order in which content appears. In Edit Mode, simply ‘drag and drop’ using the up/down arrows to the left of each item (similar to re-ordering your Course Menu). You can also use the Re-order content button and use the up/down buttons to move items up and down. You can see what the item/content folder looks like to the student by turning off Edit Mode. There are two main ways of using folders to organise your material; content-based and chronological order. An example of content-based organisation is creating a folder for all your lecture notes, another for readings, a third for presentations, etc. An example of chronological order is to create a folder for all Week One materials, another for Week Two etc. Items and folders can be copied between areas of a module, and/or between your modules. You can also copy and move items/content using Course Files and Course Copy. To copy an item in a content area, turn Edit Mode on. Then, roll over the item and you will see a down arrow next to it. Clicking on it opens up a menu containing various options relating to the item, as shown. To copy the item, click Copy. Select the Destination Course (the default will be the current module). Click Browse to open the Course Map; select the area or folder where you want to copy the folder/item to and click Submit. If you would like to move the item, just click Move instead and follow the steps above. Copying/moving items involve standard steps that will become familiar to you as your use of the VLE increases, but remember to check your Course Files if you are moving content from one module. The School’s module template will pre-populate your module with have content areas; you don’t need to change any of these content areas if you don’t want to. Ensure Edit Mode (top right of the screen) is turned on. You will notice an add (+) button appears above your module menu. If you hover over the add (+) button you can choose to add different menu items. Module Page: create a module ’homepage’ and perhaps use this as the entry point for your module. Blank Page: is a page used for one piece of content created with the text box editor. Tool Link: a direct link to one of the tools. Web Link: a link to an external website. Course Link: a direct link to another location within this module. Subheader: add sub-headings to help organise your module menu (will appear in bold). Divide: add a dividing line to help organise your module menu. Simply select the item you want to add to the menu and follow the on-screen instructions. New menu items always appear at the bottom of the menu. Any empty content areas will automatically be hidden from students. They will also not be visible to you when Edit Mode is turned off. When you are in Edit Mode, empty content areas will be indicated with a dotted square icon. In Edit Mode, you can re-order your menu items. If you hover over any menu item you will see the up/down arrows appear to the left of the menu item. If you then click and drag on these arrows next to the menu item you can reposition as you choose. Release the mouse button when you have moved the menu item to the desired place on the menu and your changes will be saved. Rename link – change the name of the menu item. Hide/Show link – make the menu item available to students. Hide = unavailable, Show = available. Deny/Permit Guests – allow ’guests’ (users not enrolled on the module) to view this item. Delete – permanently remove menu item. As students cannot see empty areas or areas that are hidden, you don’t really need to delete the menu item, especially if you think you may need it later on. When your module is set up the way you wish, you have an introductory announcement and some preliminary material (remember you can – and should – add new resources all through the year) then you must make your module available to students before they can access it. From the Control Panel, under Customisation select Properties. In Set Availability, make sure the Make Course Available option is Yes or change it to Yes. Click Submit. The link to the course in Current Modules will now be available to students. It is important to note that when a module is first created it is unavailable to students and appears with the text unavailable to students in brackets and in coloured text next to the title in the Current Modules list.